Notre Dame Cathedral, a Gothic, Roman Catholic cathedral on the eastern half of the ÃŽle de la CitÃ© in the fourth arrondissement of Paris, France. 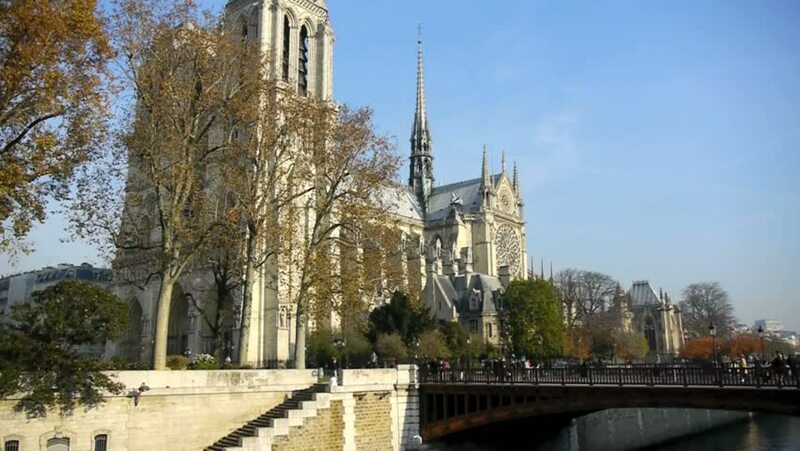 4k00:08PARIS, FRANCE: May 05, 2016: 4k footage of Cathedral Notre Dame de Paris on square Parvis Notre-Dame - place Jean-Paul-II with lot of people at noon. 4k00:20Bury St Edmunds England urban city center church park garden. St Edmundsbury Cathedral is the Church of England's Diocese of St Edmundsbury and Ipswich. A church since 1065. 4k00:13GHENT, BELGIUM - November, 2017: Architecture of Ghent city center. Ghent is medieval city and point of tourist destination in Belgium. 4k00:12PARIS FRANCE - AUGUST 2015: Looking across the Seine river to the iconic Notre Dame Cathedral. Shot at dusk. 4k00:10BURY ST EDMUNDS, ENGLAND - 9 SEP 2018: Bury St Edmunds England city church and garden park pan. A church has stood on the site of the cathedral since at least 1065. A market town in Suffolk. Tourism.